High whispy clouds, sunny warm “indian summer” days, high pressure off shore winds, pumpkin carving, Halloween, apple picking, raking leaves (if you got em) a slight chill to the early mornings and evenings and of course uncrowded fishing. These are all things I look forward to during my favorite part of each year. Well I can officially add one more great thing to look forward to for Fall / Autumn and that is a late honey harvest! Mike came over roughly a week ago and harvested our honey out of our hive. Unfortunately I had to work that day so I was unable to participate in removing the frames from the hive and placing them in the centrifuge. There were not a lot to load but just enough to get a good and memorable supply of first harvest honey. Certainly enough to share with friends and family. 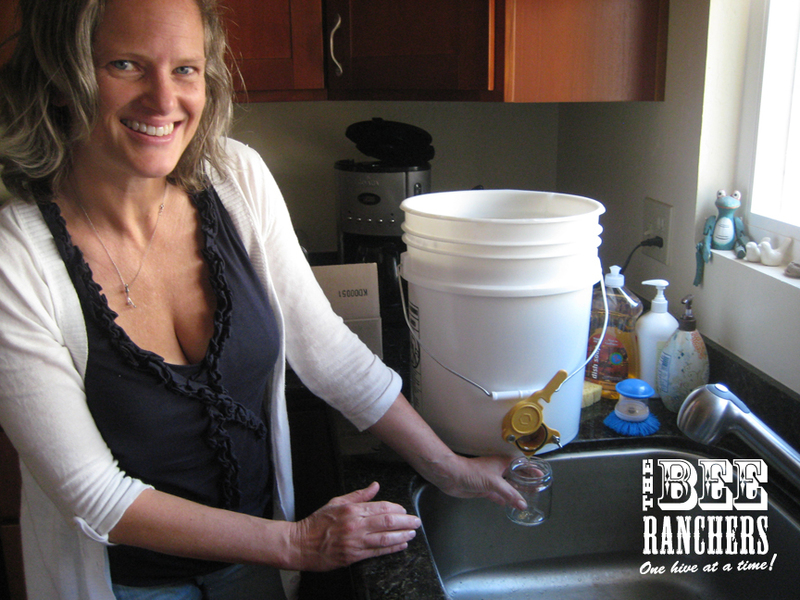 While I was unable to assist with the core extraction, Mike left the bulk honey in a 5 gallon bucket with spigot so our family could have fun and participate in jarring the honey. Mike also supplied us with 9oz. jars with lids. We decided to pick a saturday to jar our honey so the whole family could participate. 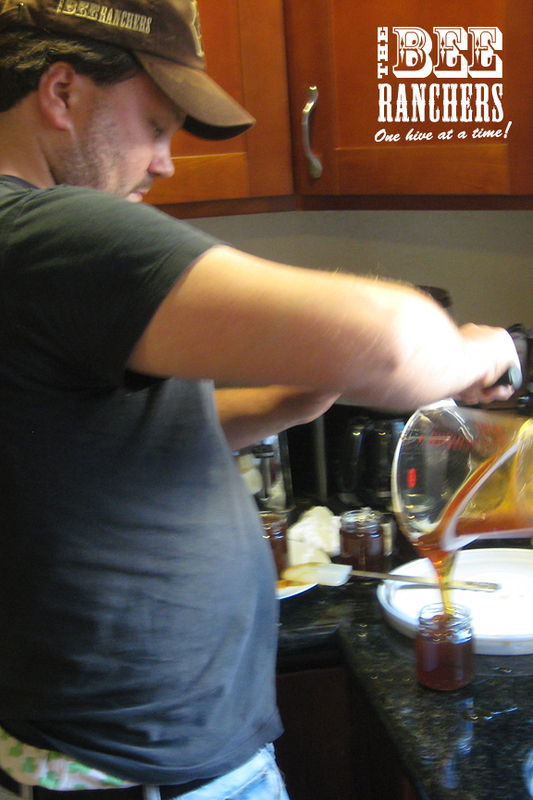 First observation, the honey was extremely thick – something Mike had noticed as well. Second observation, it was a dark amber color. This is not your golden Spring time honey! 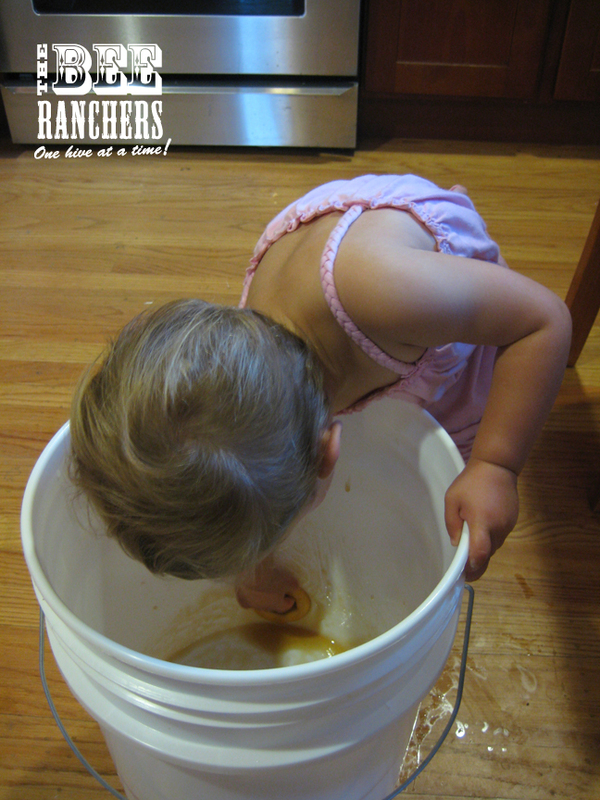 Third observation, this is an activity that the whole family can have fun with, from the pouring to the jar filling. 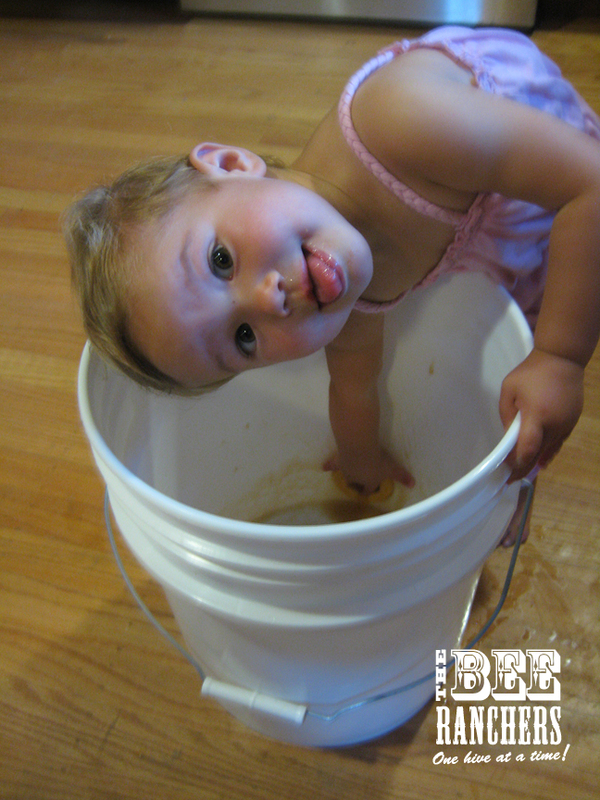 Even the littlest of hands can help, especially to clean the empty bucket with their fingers! We’ve even been able to come up with a custom label that will be applied to each of our jars announcing our special honey. Bottom line, super fun and well worth the wait. I can almost guarantee that the best honey you’ll ever taste will be from your own hive’s first harvest! A shout out to our honeybees, BRAVO and well done! 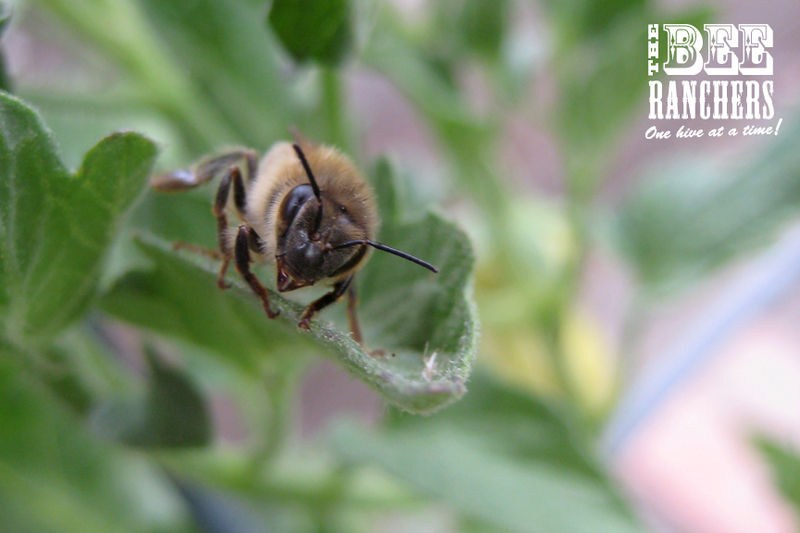 All your hard work is sustaining your thriving hive and leaving a little left over to share with us. Thanks, you truly are the hardest working honeybees in Contra Costa County and you’ve been a great addition to the family!!! 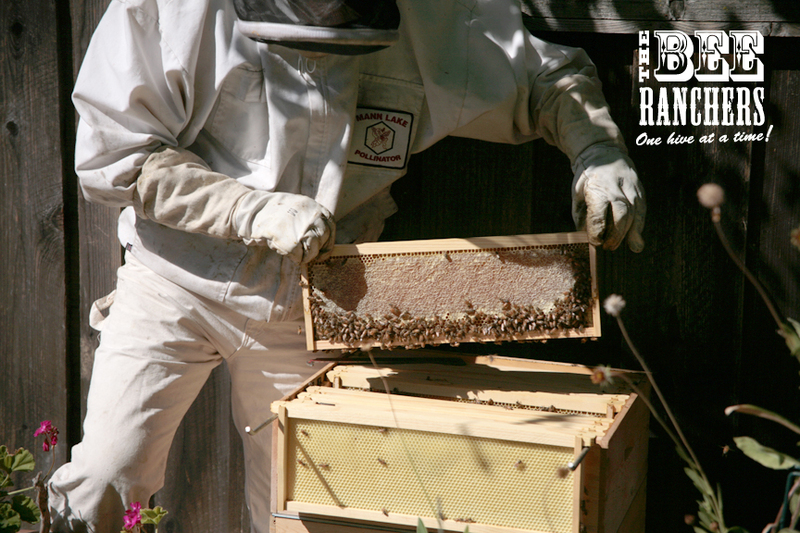 This entry was posted in Bay Area, Fall, Hive Diary, Honey, Honeybees and tagged Bay Area Honeybees, Honey Harvest, Honeybees, The Bee Ranchers by beerancher. Bookmark the permalink. 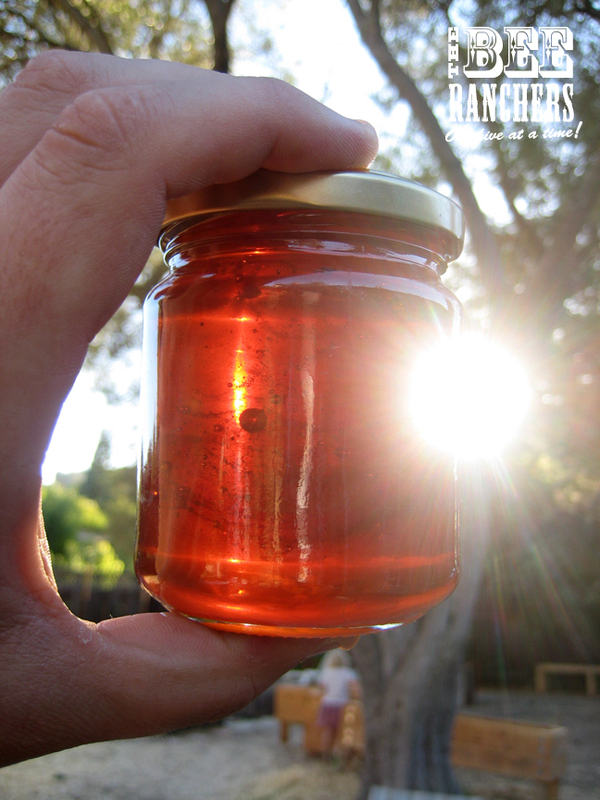 Congratulations to your Family on a very lucky, beautiful, first Honey Harvest! Sweet aint it? Love the label. P.S. just have to say it’s a good thing your girls are over the age of one – otherwise scooping up the Honey too young isn’t safe – something home growers need to remember which doesn’t come on a label! JV, RD – thanks for the congrats and feedback. Always great to hear from people. And thanks for the reminder on raw honey and infants. 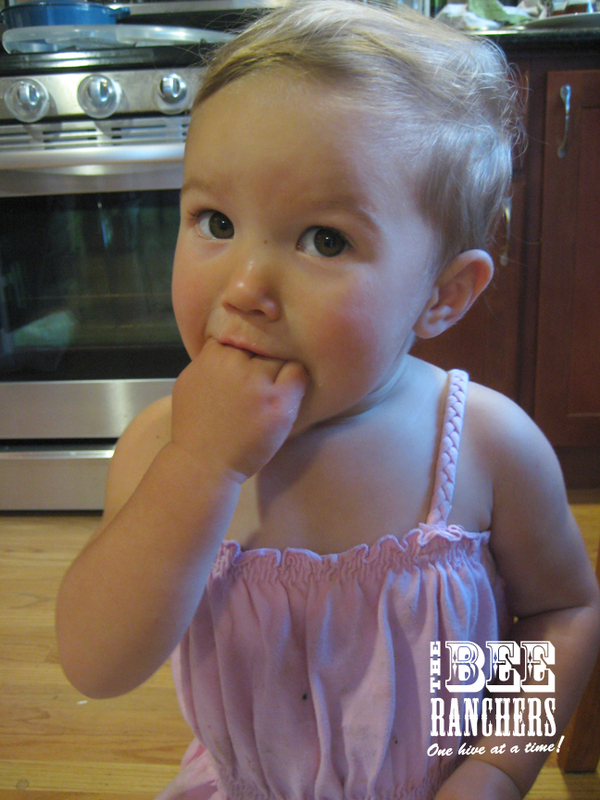 You are absolutely correct on the importance of not feeding raw honey to infants. Their under developed immune systems are not worth risking an unpasteurized food product.